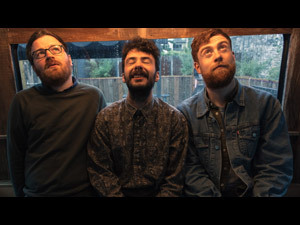 Half Forward Line is the new band from Brian Kelly (So Cow), Niall Murphy (Oh Boland) and drummer/recordist Ciaran o Maoláin. The trio have crafted a short sharp dose of power pop, recorded over two days in the lounge of a derelict rural Irish pub. "The Back Of Mass" takes in tales of wedded bliss, social anxiety and the perils of letting someone try on your glasses. 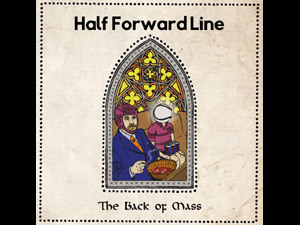 Infused with the pioneering jangling spirit of the Flying Nun roster, along with garage rock sonics and Kelly's inimitable brand of buzzsaw pop and slice-of-life lyrics, Half Forward Line have delivered a half-hour album hallmarked by hook-laden songs. It's not Kelly's first time on Rusted Rail as the label released his debut EP "Best Vacation Ever" as So Cow back in March of 2006. The Half Forward Line albums is available on cassette (with a download code) from Rusted Rail, with the CD version being handled by Jigsaw Records of Seattle. This album is a cassette release with a 4 panel colour sleeve and a download code.